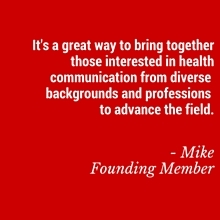 We’re passionate about health communication and changing the way our field works together. We believe that bringing together health communication professionals from all levels of government, nonprofits, industry, and academia will help strengthen our field. Health communication is a multidisciplinary field of study and practice that applies communication evidence, strategy, theory, and creativity to promote behaviors, policies, and practices that advance the health and well-being of people and populations. We use this language to explain and advocate for the continued strength of the field of health communication. Purpose: This committee is just getting started - join today to help shape the focus and direction of the group! If you're not currently a member, follow us on Twitter or sign-up for email updates for more details on Society activities.